my self ravi mathur i am tour guide since 4 year i am living just near the jodhpur fort whee situated old city the heart of jopdhpur it would be very interesting for tourist to walk in Small street and old market whee is certain street for particular special thing like spices steer will give u nice fregerences nice old temple i have owen gust house so u can enjoye with real india food and family. get answer why the bishnoe people wear white turben ? why muslim kings won with small armey before big mahajas armey ? how does they make mejestic and regal jodhpur fort ? why jodhpur is blue city not white or black ? why maharaja make jodhpur fort ? why jodhpur fort is most formideble fort ? spices are just use for cooking or else ? locally i am living in old in side BLUE city and working as local guide since 5 year. i am also runing a guest house and in my city you will fell like family it:s my promise. 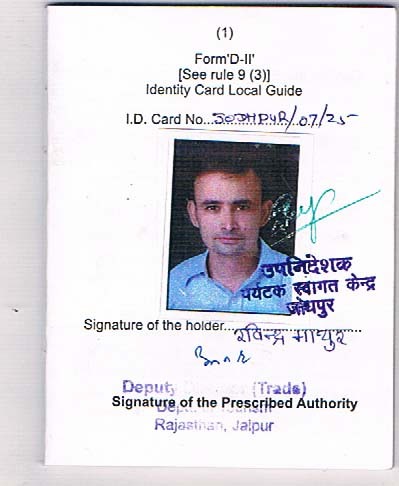 i am authorized by Indian government.